In its shapes, forms, and construction, the Tarot's Hanged Man is rather simple compared to many of the other cards saturated with symbology. Yet The Hanged Man remains one of the most mysterious images in the deck. Often regarded as a representation of martyrdom or sacrifice, The Hanged Man embodies so much more. Though it depicts the figure of a man hanging head-down on a cross-like tree, he appears to be far from death. The shape of his body (with one knee bent and arms behind his back) looks almost like that of a dancer, especially if you view him reversed (right-side-up). His crown is illuminated with a halo of warm light. Even the tree from which he hangs is verdant, covered in clusters of green leaves. To me, The Hanged Man represents an attempt to convene with the spiritual forces that can dramatically alter our lives. Like a yogi in an inversion, The Hanged Man has willfully placed himself in an uncomfortable position in order to gain a new, fresh perspective that comes with a quick rush of blood to the head. In a reading, The Hanged Man can pose some difficulty, depending on the context. Through my encounters with him, I have been able to map out three prominent meanings or characteristics to keep in mind when he pops up in your next spread. "His head glows with the radiance of his autonomy." The Hanged Man hangs alone. He lacks the company of peers, rulers, angels, or even animals, which we find elsewhere in many cards throughout the deck. His experience of the world is his own, and is one that may not be understood by others. The Hanged Man’s plight is to perceive the world from an opposite angle, to deviate from the norm. We are so often herded by society into paradigms that are mostly arbitrary and not of our own creation. The Hanged Man takes a different approach, willfully altering his perspective and allowing his inner thoughts to guide him. His head glows with the radiance of his autonomy. His body reclines in an impossible position, discarding society’s instructions to blend in. He is enlightened, having found total freedom through his own self-awareness and acceptance, regardless of his physical entanglements. As a representation of individuality, I see The Hanged Man not as the selfless martyr, but as the self-aware nonconformist who has dedicated himself to the task of free-thinking. When you see him in a reading, he may be an indication that you need to let go of an unattainable lover, and learn to love yourself, or that you need to let go of the prescribed notions you may have about life, spirituality, or your own place in it all. Many cards in the Major Arcana are archetypal representations of a concept. The High Priestess is an archetype of receptivity for the subconscious, a passive representation of received inner wisdom. The Hanged Man is receptivity in action. Imagine him climbing up the tree and positioning himself upside down, hanging himself—not as an act of self-harm, but active surrender to experience. The Hanged Man represents someone opening himself to what I call Creative Forces, an external magic/energy that flows through us, what we might call inspiration, spirit, communing with the subconscious. The concept of active surrender is one of the card’s paradoxical charms—we often say The Hanged Man gains control by letting go. ‘Sensory gating’ is a natural brain function that filters out much of the sensory stimuli we encounter to prevent us from becoming overwhelmed by our very existence! We are biologically hardwired to wear a mental armor against the onslaught of experience. The Hanged Man is removing that armor, even if only momentarily, becoming vulnerable to the full experience of life and its sensuality, emotions, and spiritual forces. He is opening himself to creative forces, much like The Magician, inviting that energy to move through him like a current. This creative juice is then emitted in the golden nimbus around his crown, suggesting a creative enlightenment only be attained through receptivity. In a reading, this characteristic of The Hanged Man might be seen when someone is concerned with the direction of a creative project, struggling with writer’s block. 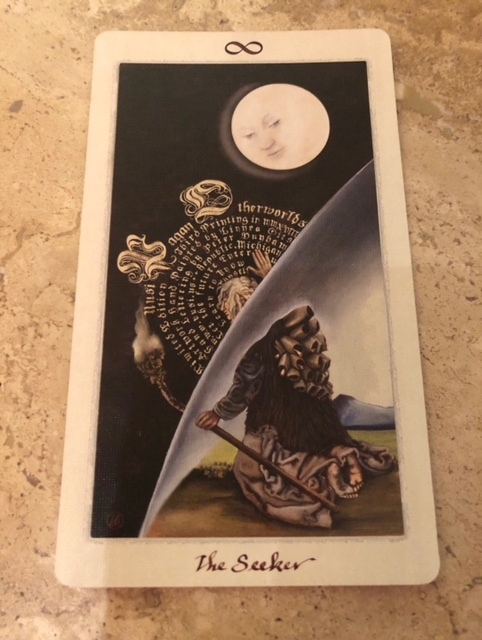 The Hanged Man suggests the seeker submit to radical vulnerability with the creative forces that exist outside of us, and allow that energy to flow freely through the seeker. The Hanged Man is interested in matters of the spirit. The Hanged Man has always appeared to me to be suspended in a kind of meditation. When he appears in certain readings, I take this as a message to stop everything and meditate. Whether that means you actually sit down, cross your legs, and dust off your meditation practice, or just allow all the pressures and concerns of life to be contained elsewhere for a while, dedicating the space and time for reflection is one of the most important methods of self-care we have available to us. The Hanged Man doesn't concern himself with the anxieties of daily life. He's interested in matters of the spirit. This is revealed to us through that glowing nimbus he is so famous for, and the impractical position of his body, which allows him to do nothing but hang! Sometimes, his message to us is simple: just hang (suspend, stop, quit trying and just be). It's easy to make mistakes and get overwhelmed when life’s pace becomes to hurried. Sometimes the most important thing is to take a break from the rat race and reconnect with whatever nourishes us most. FROM CECILY: I once conducted a reading for a rather drunk gentleman in a banana costume at a Halloween party. For parties, I always shuffle and present the cards upright to keep the deck fresh and avoid the complexity of reversed cards in shorter readings where time is limited. Nevertheless, Banana Man managed to reverse some of the cards and his Past / Present / Future spread appeared as Eight of Cups (the need to leave a situation behind) / The Hanged Man Reversed (an inability to shift perspective or let go) / Eight of Swords (the self-imposed confinement that accompanies the inability to see reality and oneself honestly). I had a hard time talking to Banana Man—he wanted to do most of the talking—but he did tell me a heartbreaking story about his fiancé leaving him abruptly after a tragedy in her life. In his tale, I could hear hints of feelings and needs that his fiancé was trying to communicate, but that he couldn't quite see. He could not view himself as anything but a victim, and the reversed Hanged Man in his reading was a sharp and dead-on indicator of where he was—stuck in a singular and limited view. The reading was quite difficult and unproductive, and I ended up hurting his feelings after he told me he was a really great listener and I responded by pointing out that he'd been talking through most of the reading. I lost him after that, but he wasn't fully present or receptive to begin with. His was the worst reading I've had ever (by far), and I was a bit devastated that I couldn't reach him. But The Hanged Man Reversed was a sign for me that Banana Man just wasn't ready for the harder truths he needed to accept in order to grow and move forward.